In the past I would justify self care only if I had done something to earn it. I was only allowed to lie in bed in the evening if i had been active all day. I was only allowed to eat chocolate if i had eaten super healthy the rest of the day. I was only allowed to watch a series if i had done all my studying and all my work. I would never just treat myself or be kind to myself without earning it. 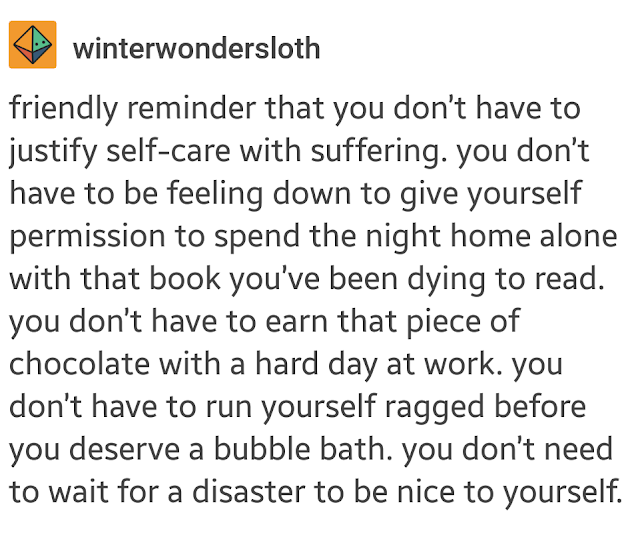 But some point in my life i realised... i dont need to earn self care. I need to learn to treat myself right and that means that somedays i need to rest and i dont need to have "earned it". And somedays i need lots of chocolate and i dont need to have earned it by eating super healthy the rest of the day. Of course having something as a goal, such as "i can watch the latest series episode if i do all my work" that is one thing... that is a motivator, and a "feel good" when i have earned my series watching time. But i also have the balance of not being too strict and allowing myself to take care of myself without having to justify it or earn it!! It is something which can be good to think about or remember :) That self care doesnt need to be earned!! As the saying goes "a little of what you fancy does you good" - and that's a good quote to live by. I totally agree, you don`t need to "earn" your treats - a motivator to get you through the day as something to look forward to yes, as that often helps me. But sometimes you just need to have something or do something "just because" - and that's how it should be. Exactly. Sometimes having something as a goal is a motivator but at the same time sometimes eating some chocolate is self care and it doesn't necessarily have to be earned by eating strict the rest of the week.